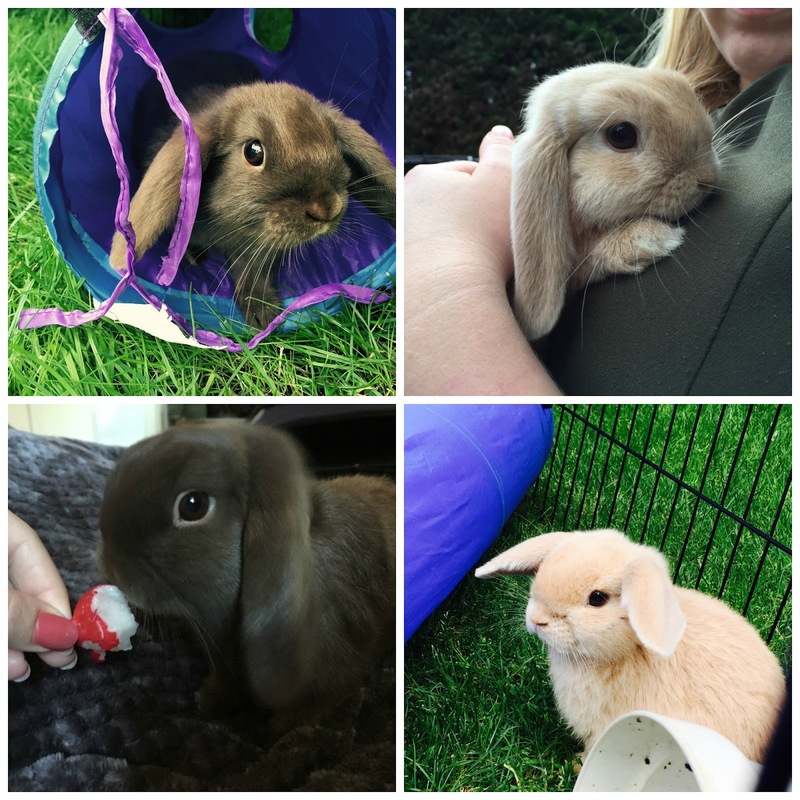 If you have read my blog for at least the past few months you will know I recently got two baby bunnies (original post HERE) called Coco and Bean. I thought I would write a little update post as Coco and Bean have grown so so so much, and because they have been growing so quickly we have upgraded their hutch so they have plenty of room to relax in, make a mess in and generally be little monkeys in! They have also been extra spoilt and have a huge run in the garden. Size difference in the picture on the right. This hutch was from eBay again and was £89.99, which again, like the first hutch we got from eBay, is a real bargain for the size and quality! Coco is a typical woman, it's her way or no way! She loves cuddles, on her terms and she can get a little moody if she isn't impressed with something. Out of the two of them, she is a greedy little sod and will eat everything and anything in sight! Bean loves cuddles, he is the much more chilled one out of the two however he has recently decided it's fun to hump his sister, so today he has had his little 'beans' snipped so we don't end up with several baby bunnies! As cute as they are, two is enough! I think they are very lucky little bunnies as they get lots of fresh fruit and veg every night (we printed out a safe food sheet from the Rabbit Welfare Fund website) before bed time and they are out of the hutch everyday, whether that be in the run in the garden (when the weather is nice) or running around in the house causing mayhem. Bunnies are extremely cute, but they grow into big rabbits so if you are thinking of getting them, remember they are a big commitment like any pets, they need lots of love, time and attention. They cost money too - food, bedding, vaccinations, neutering, toys etc aren't cheap. I clean Coco and Bean's hutch out every other day, even standing in a rain coat in the rain to make sure they have a clean and comfortable bed, luckily, we have littler trained them from a young age so they are quite neat and tidy bunnies. I love these little bunnies to bits! Have you got any bunnies or any other pets? Keep updated on what Coco and Bean get up to on my Instagram (search for #CocoBean). They are so cute, I'm sure my children would love to keep bunnies! The bunnies are so adorable. We had bunnies when I was small and one was called snowdrop.